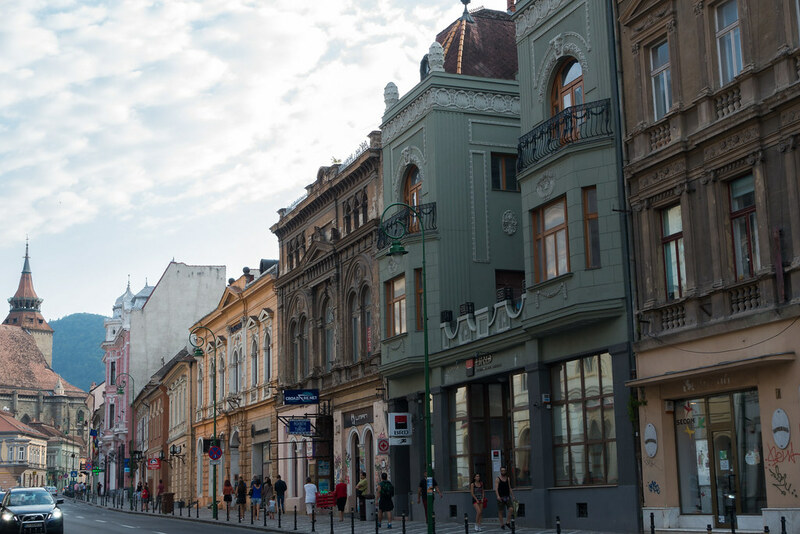 Post 4 of a series detailing our Eastern Europe road trip. View all the posts so far here. 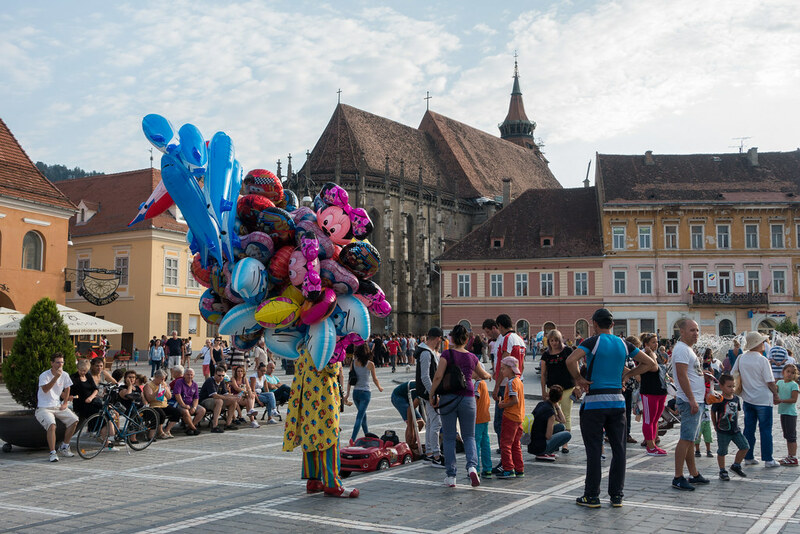 Brasov was my favourite place in Romania, and I wish we’d stayed longer. Nestled within forested mountains (full of bears and wolves! 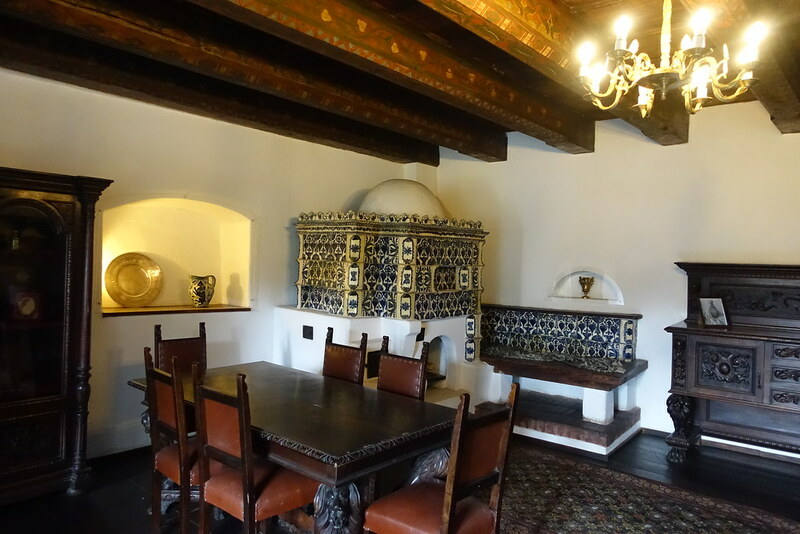 ), this beautiful town and the surrounding area offer plenty to see and do. 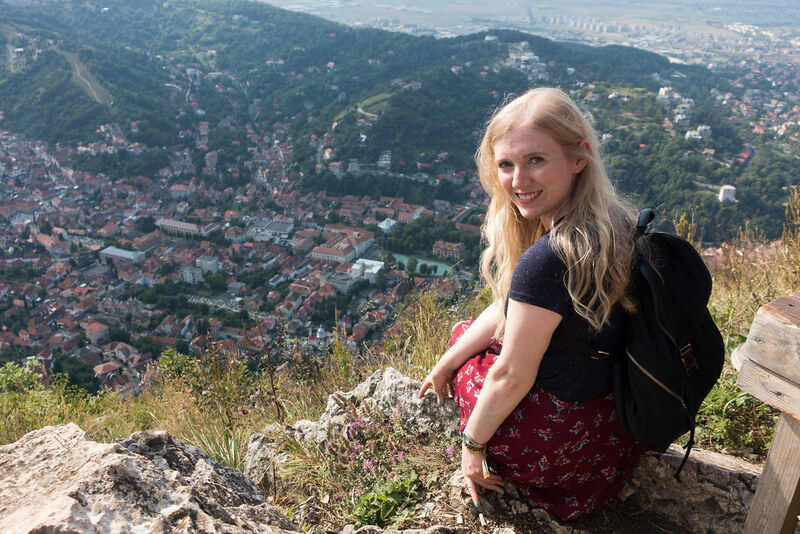 The gothic architecture and panoramic views – from both the top of Tampa Mountain, and our airbnb’s balcony – stole my heart, and I thought that even super-touristy Bran “Dracula’s” Castle was worth seeing. 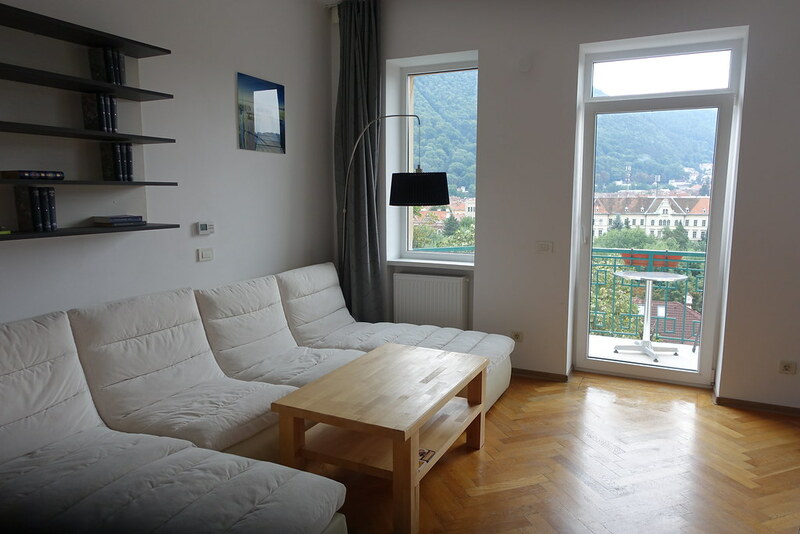 We stayed in a gorgeous airbnb studio in Brasov, perched on a hill overlooking a pretty park where old men sit and play card games. 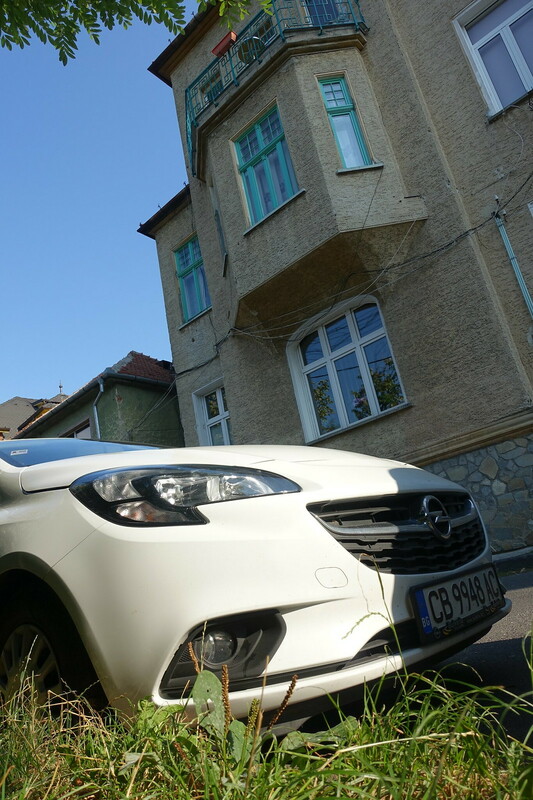 Pulling up in our white hire car (now named Tic Tac), we were greeted by our host Ovidiu and his two young sons. I was delighted to see how stylish and modern the flat was, and amazed by the view from the balcony. Tired after our long drive from Bucharest, we decided to cook and eat dinner at home. We ventured far enough into town just to grab some ingredients, then back at the flat I cooked Spaghetti Bolognese. 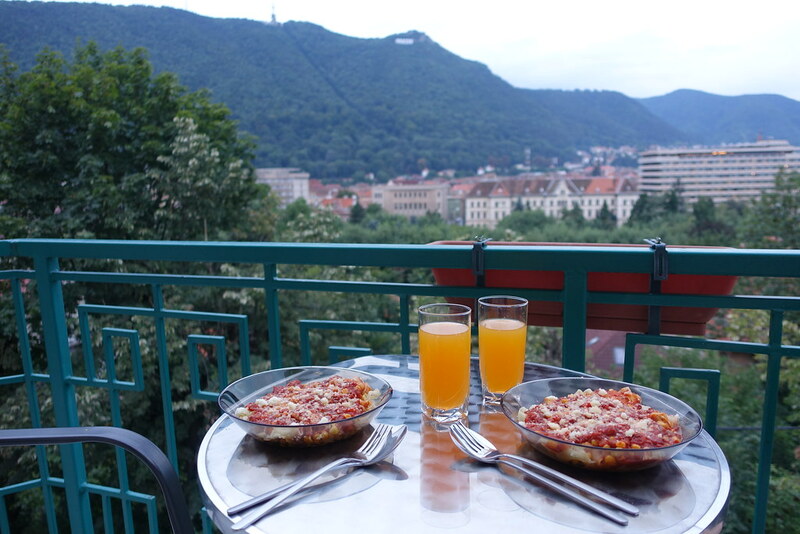 We ate it out on the balcony, looking out to the Hollywood-style Brasov sign on Tampa Mountain. 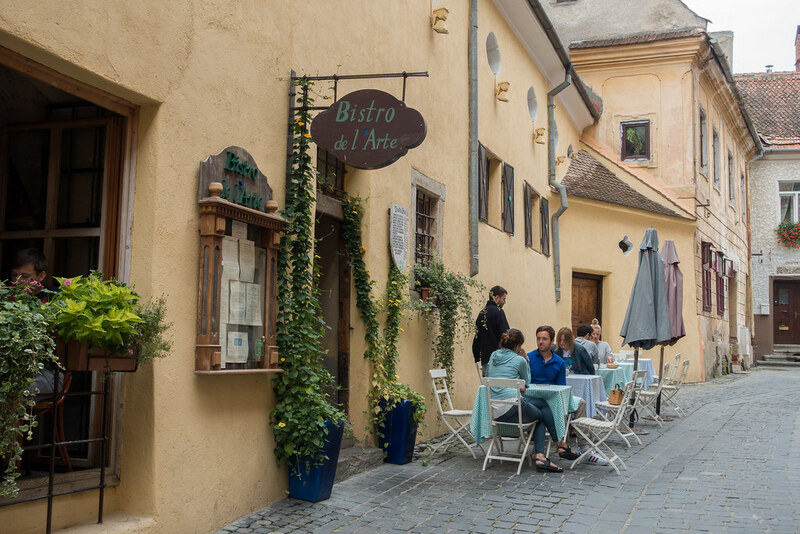 The following day we ate breakfast at Bistro de l’Arte: a cosy, wood-panelled restaurant tucked down a side street in the town centre. We both plumped for the ‘Romanian breakfast’. 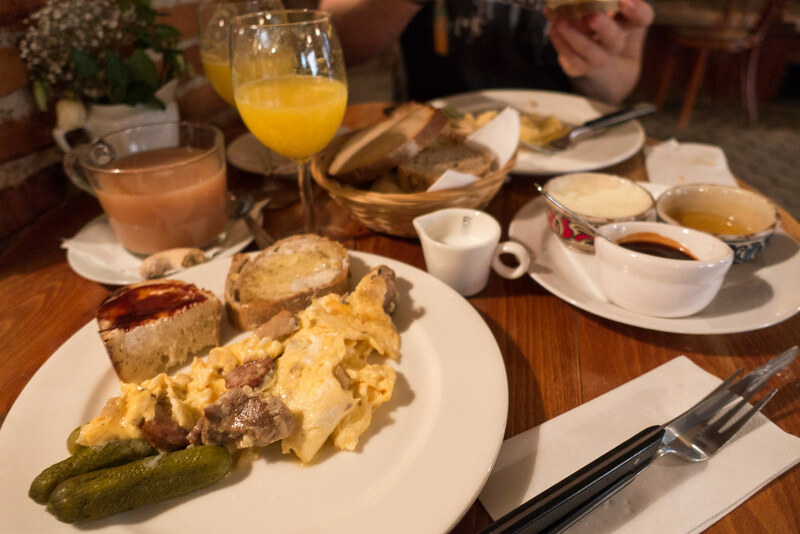 This came with scrambled egg mixed with sausage and slow cooked pork, alongside pickles, homemade bread with jam and honey, and fresh orange juice. 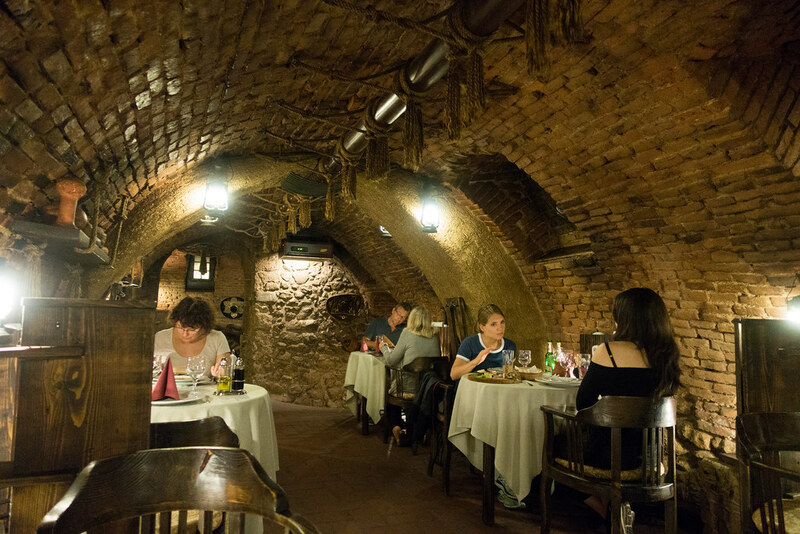 The service was polite but annoyingly slow; the experience was saved by the filling and very tasty food. 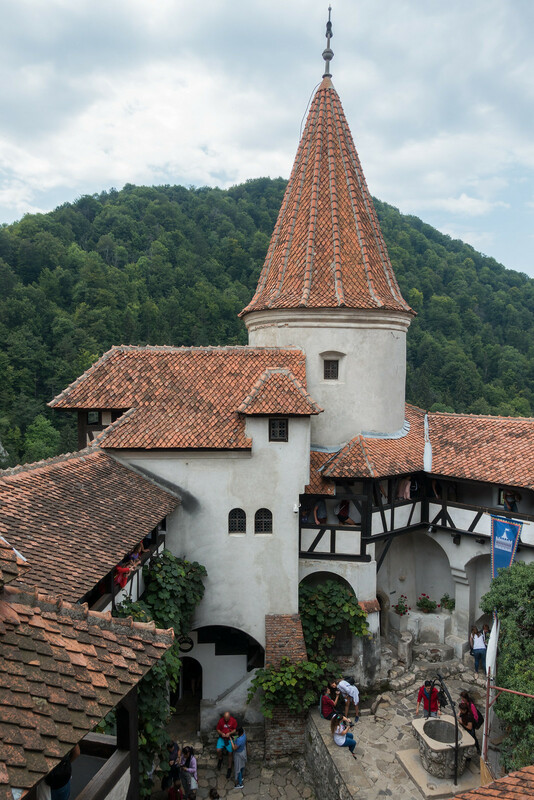 After breakfast we drove to Transylvania’s most popular tourist attraction, Bran Castle. 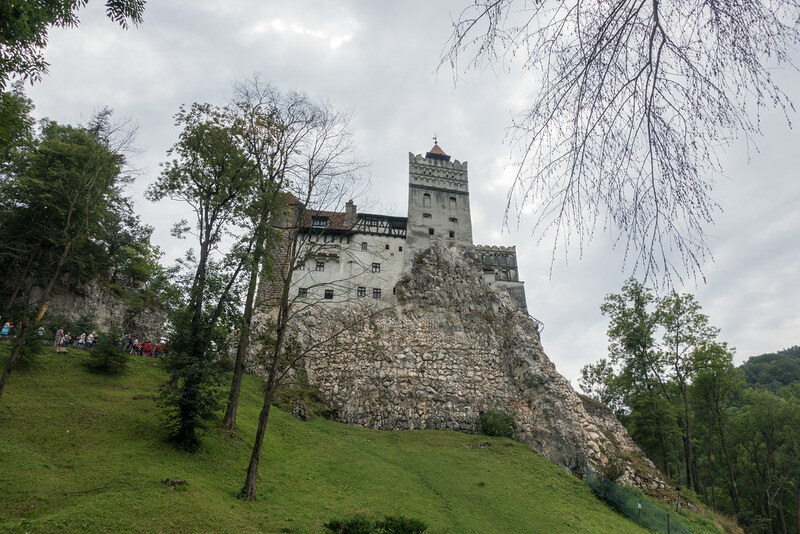 It’s become known as Dracula’s Castle because it fits the description of the castle in Bram Stoker’s vampire story, which was almost certainly based on this fortress. 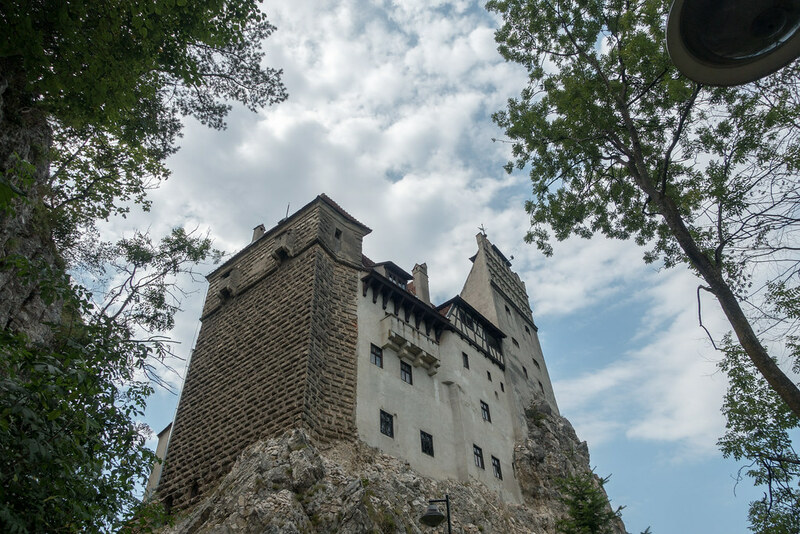 However, contrary to popular belief, Bran Castle did not belong to Vlad the Impaler, the Romanian prince who inspired the Dracula character. 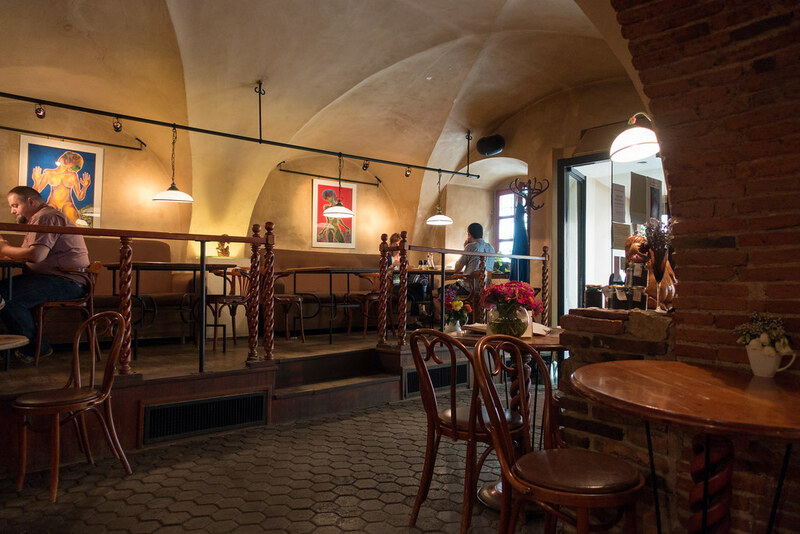 Instead, it’s thought that Vlad was temporarily imprisoned here in 1462. 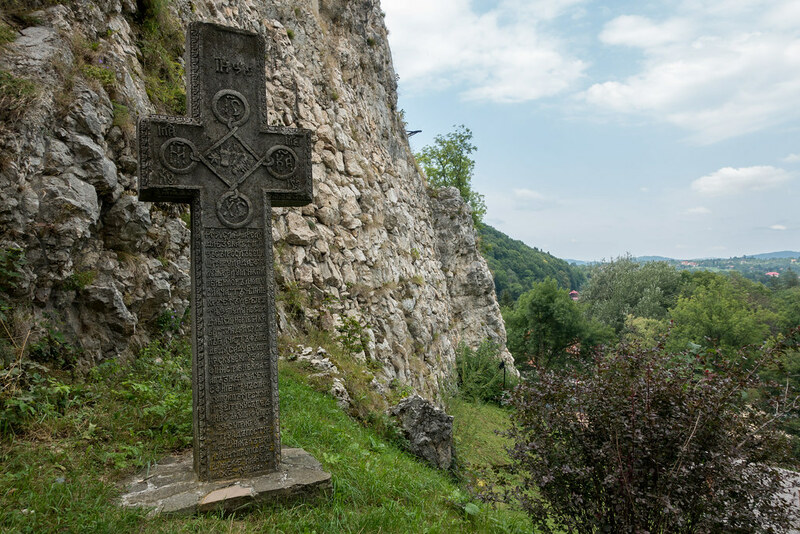 The history behind Bran Castle and the Dracula legend is explained on information boards within the castle, as well as partially on the Bran Castle website. 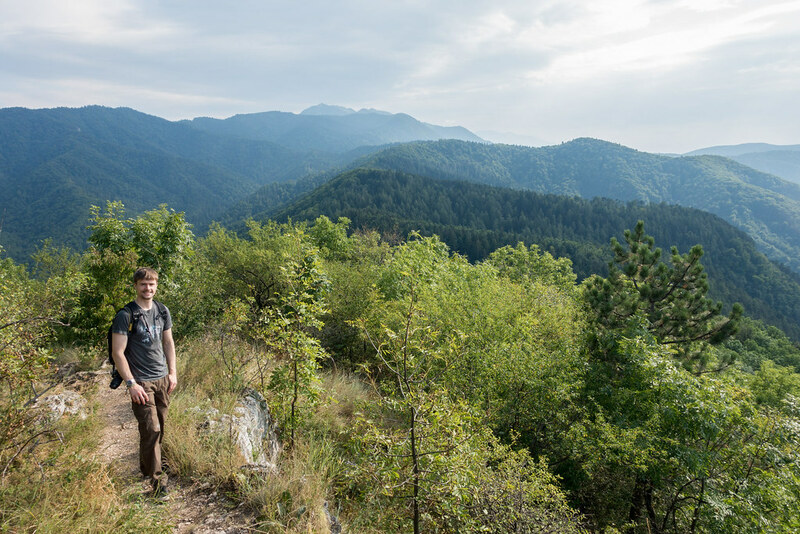 The drive to Bran Castle took us along some of the worst roads we’d ever seen. When we weren’t straddling giant cracks or swerving potholes, we were crawling behind stray cows, or donkey carts carrying entire families. Sun-baked old women and gangs of children wandered the roadside, trying to sell flowers and fruit to drivers. 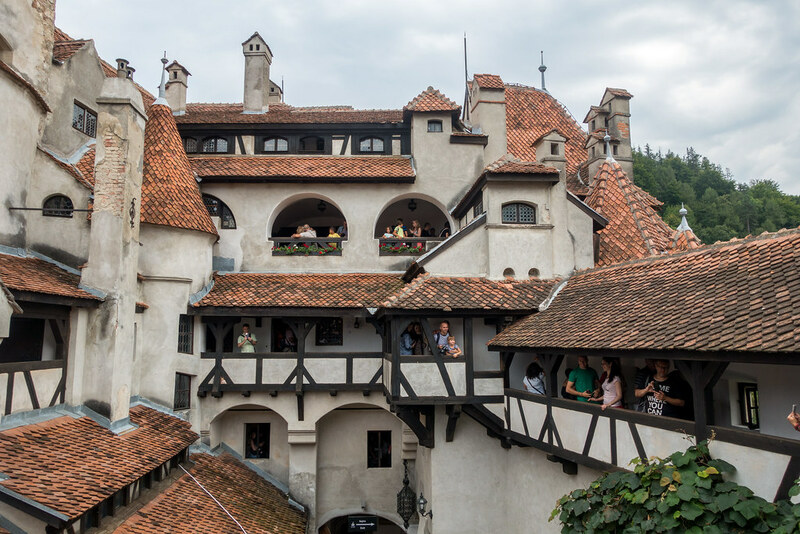 Knowing how crowded Bran Castle would be, we had planned to see it from the outside only. However, once there and among the stalls of corny vampire-themed gifts it seemed a waste not to go inside. The castle towers above the town on a rocky outcrop, and is reached by a long set of stairs. The queue to enter the castle began at the bottom of these stairs… and ended up continuing right through the attraction. 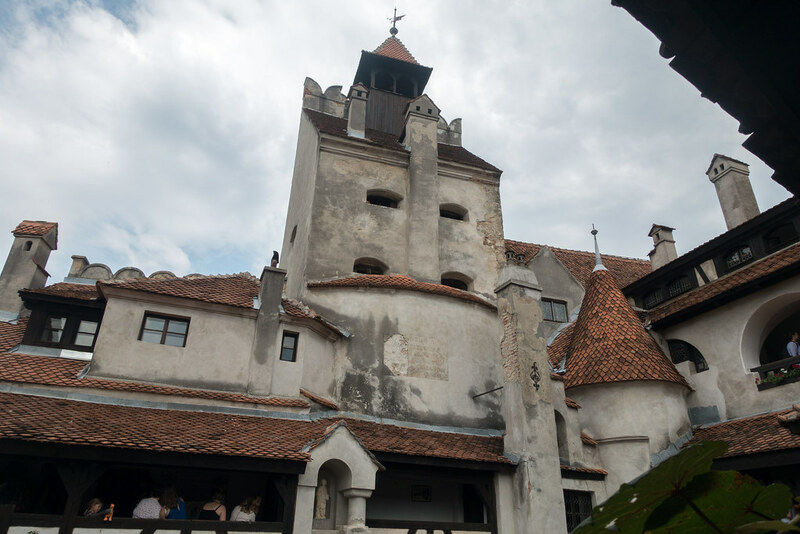 In fact, Bran Castle was so crowded that we found ourselves queuing simply to enter some of the rooms. Nevertheless, I found the twisting, multi-levelled building so interesting, and the views from the ramparts so lovely, that I was glad we’d visited. 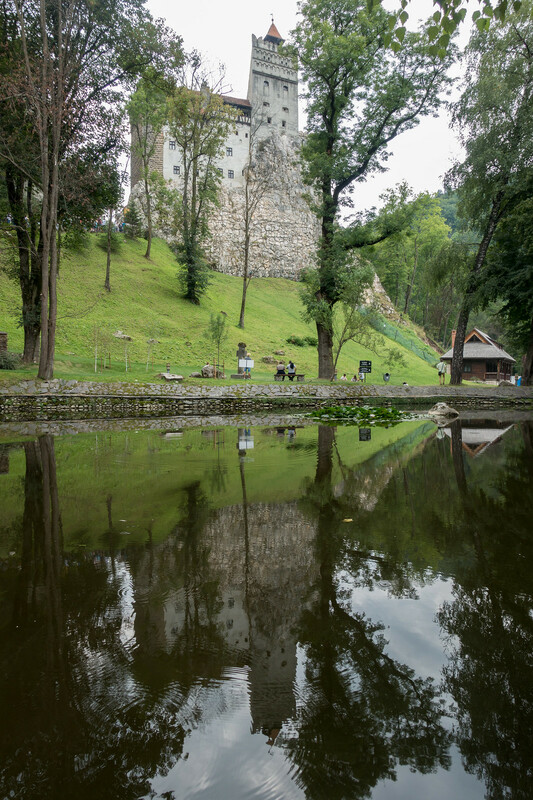 Having squeezed our way through the castle we took a walk through the garden, where we saw ‘Count Dracula’ himself stalking around the lake (unfortunately I didn’t get a photo!). We bought langos (a plate of flat dough covered in garlic, sour cream and cheese, previously seen in Hungary) to sate our appetites before driving back to Brasov. 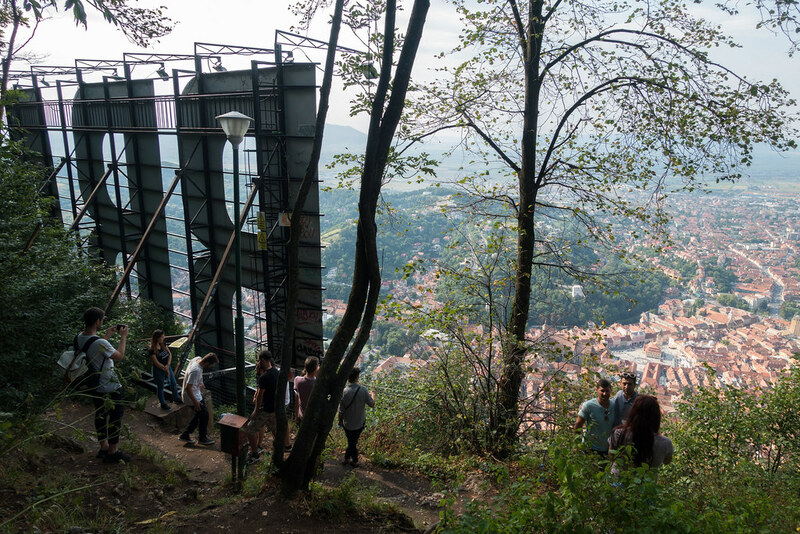 It’s impossible to miss Tampa Mountain, looming large and green over Brasov and holding the city’s Hollywood-style sign. 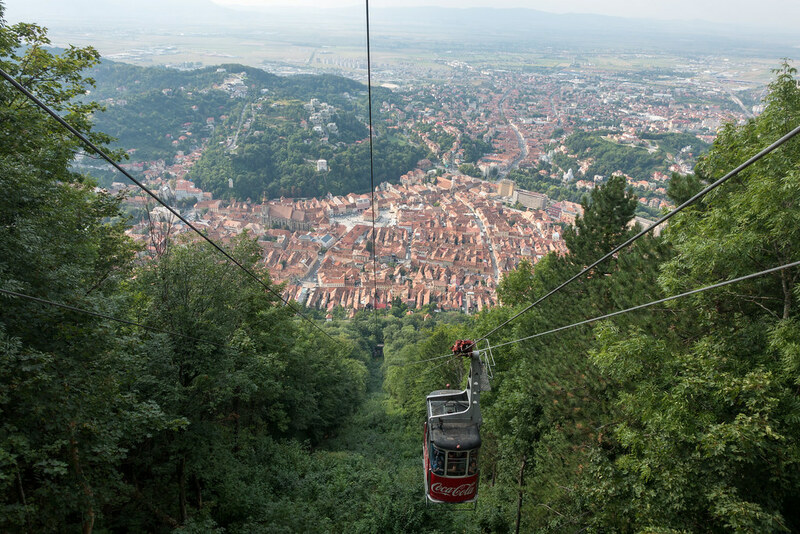 Upon returning to the city we parked at the mountain’s base and took the Tampa Cable Car up and over the treetops. From the top of Tampa Cable Car you can follow a number of trails around and down the mountain. 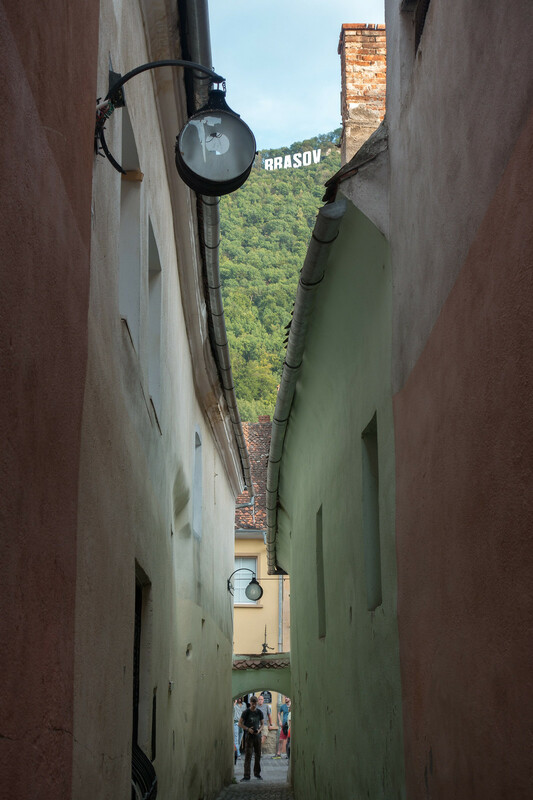 We took the shortest of these, which goes behind the Brasov sign and up to the mountain’s highest point. 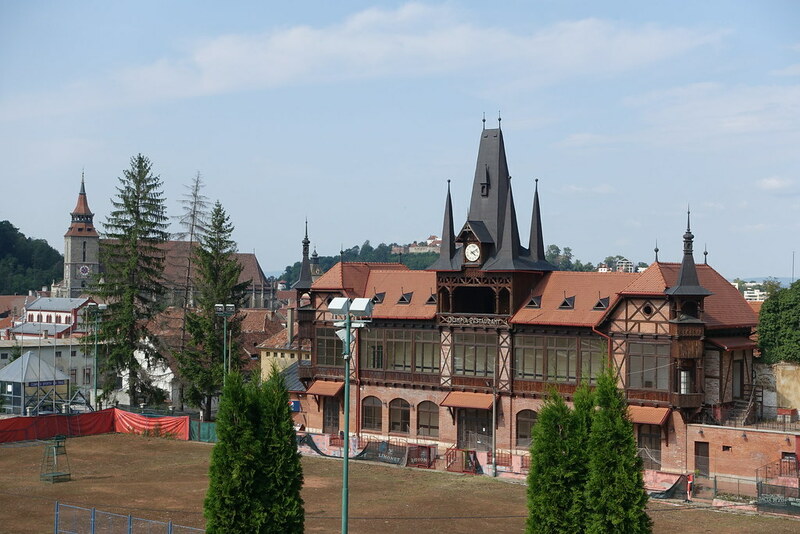 From there we enjoyed amazing panoramic views, both of the city and of the rolling forested hills all around it. 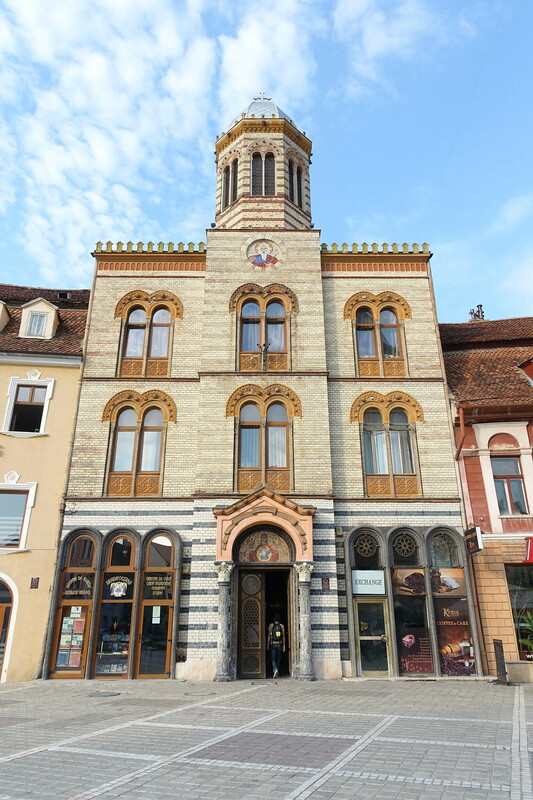 Having taken one of the last cable cars of the day back into town, we walked into the historic centre. 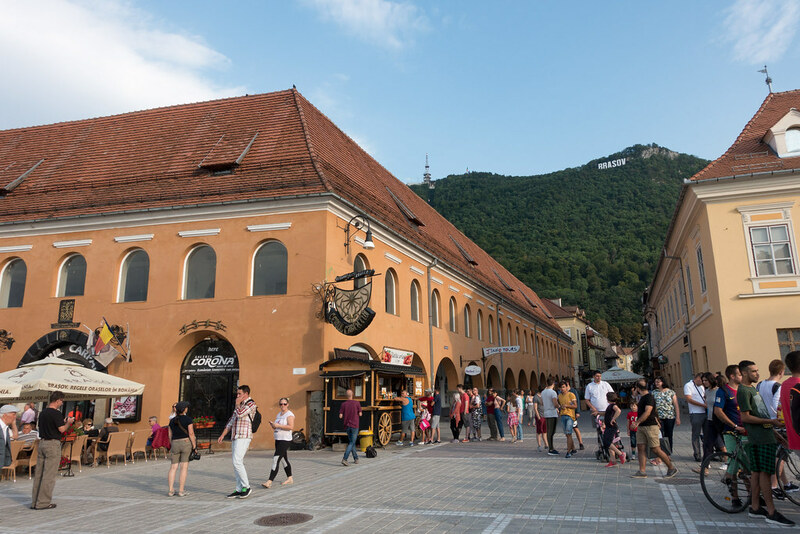 Even before reaching the main sights I was struck by the beauty of Brasov’s gothic architecture and colourful buildings, which are everywhere you look. 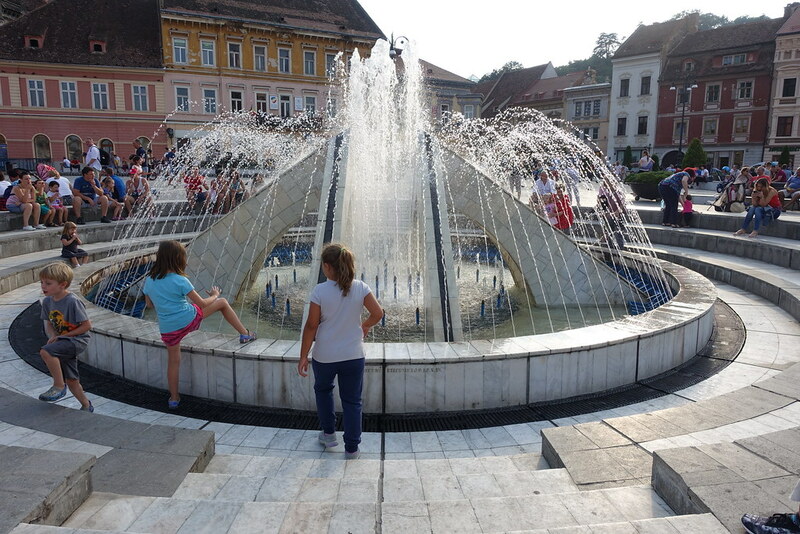 We began at the picturesque and clean Council Square (Piata Sfatului) containing a water fountain and the charming City Hall. Despite being busy with families, couples, and vendors of snacks, souvenirs and balloons, the square still felt bright, wide open and spacious. 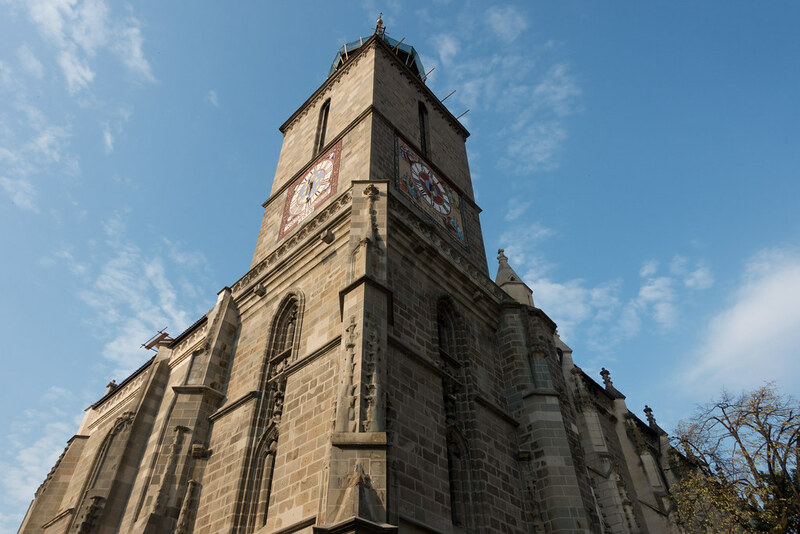 Council Square is surrounded by pretty historic buildings, among them the grand Black Church (Biserica Neagră), which became known as such after being damaged by a large fire in 1689. 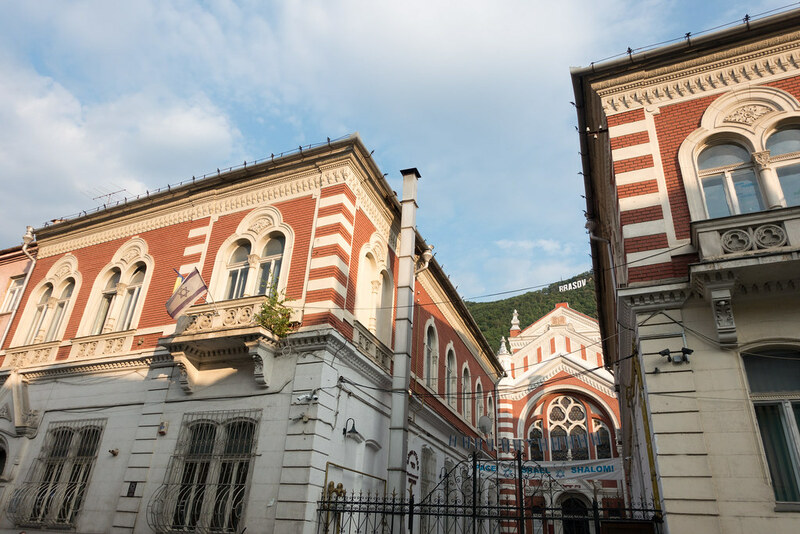 Just outside of the central square we found several other interesting sights: the fairytale spires of Yekaterina’s Gate, the stripy church Sinagoga Neologa, and the long and narrow Rope Street (Strada Sforii): a passageway so famous for its narrow proportions that it even has a museum! We were served tortilla chips and salsa as an appetiser and then Steve, probably unwisely, ordered breaded cheese as a starter. This was delightfully gooey and stringy, but absolutely huge! 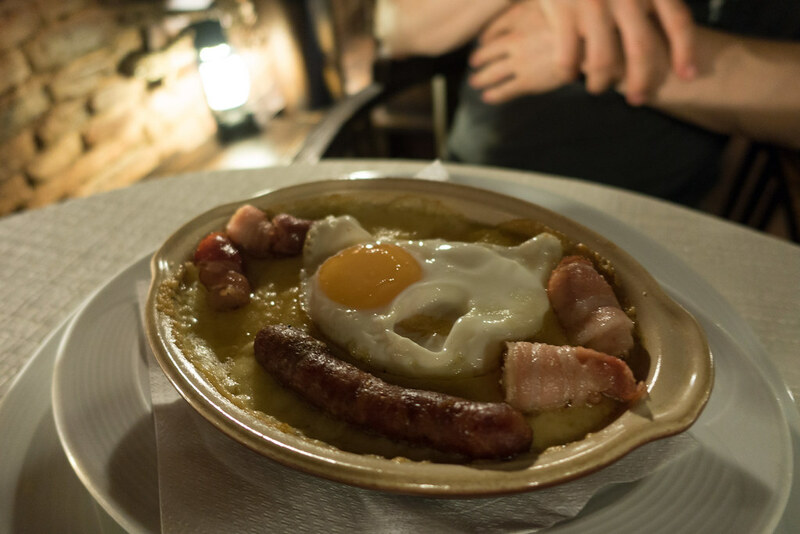 He continued clogging his arteries with his main course of Transylvania Bulz, which was polenta topped with cheese, sausages, bacon and a fried egg. 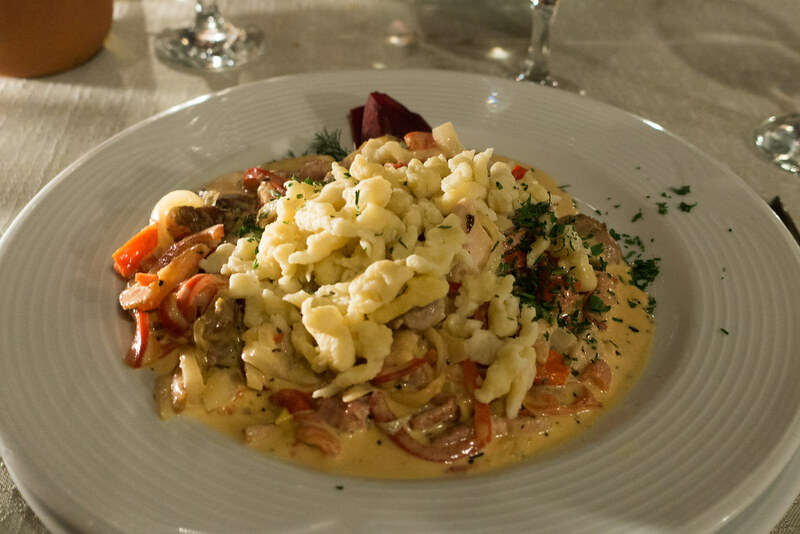 Meanwhile, I enjoyed a delicious Paprikas stew of various meats, served with best-carb-ever spaetzle (another favourite dish from Hungary). We were too full for dessert. 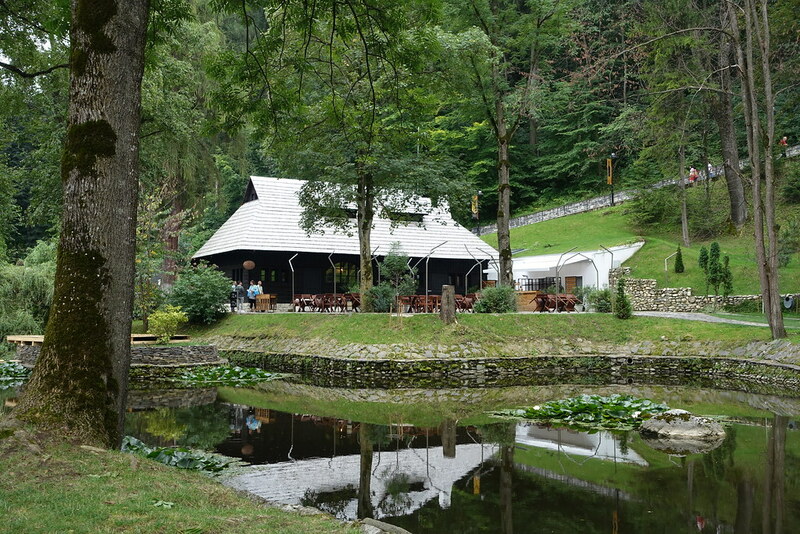 The next day would be our big drive along the famous Transfagarasan highway to Sibiu, so we picked up picnic supplies from Dodo supermarket before waddling home. Subscribe or follow Roam with Juliet on Facebook to be notified when my next post goes live. 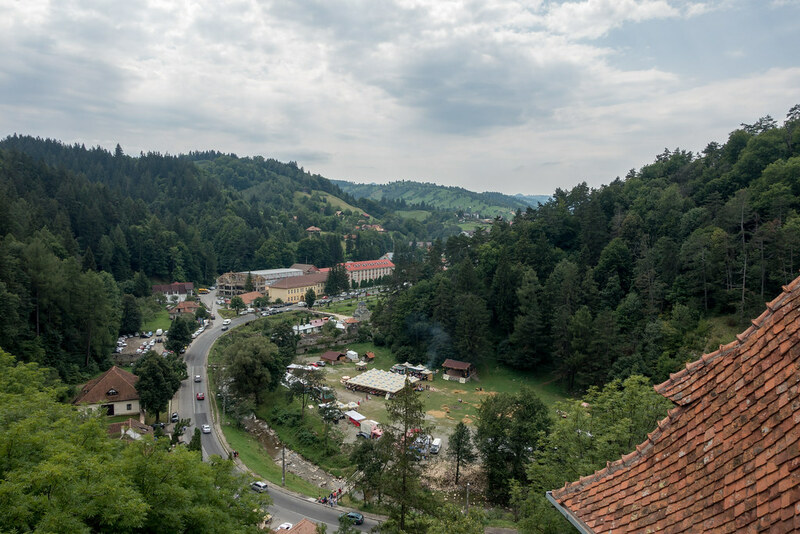 Posted in Eastern Europe, Photography, Romania, TravelTagged Bella Musica, Bran Castle, Brasov, Dracula, Tampa MountainBookmark the permalink. Such a fairytal place, i had no idea! 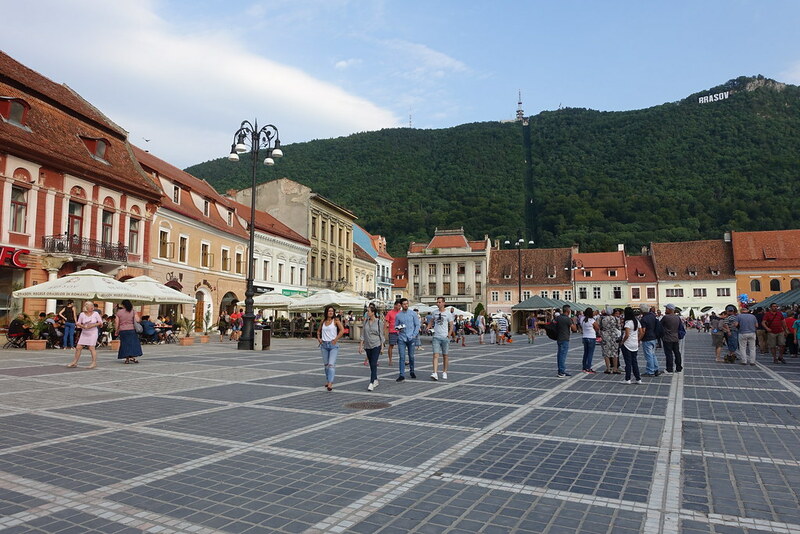 I loved Brasov so much (and the spaetzle!) Thank you for reading! Yes, it was beautiful and our flat was amazing! Thanks for reading!